Diversification is a key part of the investment process. You can diversify within a particular asset class, and also diversify between asset classes. Stocks and bonds are both asset classes. • To diversify between asset classes would be to put 70% of your investment in stocks, and 30% in bonds. • To diversify within asset classes would be to divide the 70% of your portfolio allocated to stocks within many different stocks. Likewise, investing your 30% bond allocation into different bonds gives you diversification within the bond asset class. 1. 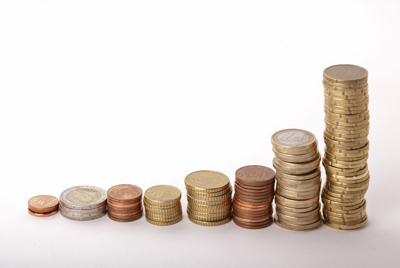 Reduce risk of total loss – Diversification helps you eliminate the risk of total loss. Investing in a single stock opens you to systemic risk in that the failure of one business would lead to a total loss of capital. Diversification within asset classes reduces the risk of total loss. 2. Reduce volatility – Having a balanced and diversified portfolio can reduce volatility. Stocks tend to be more volatile, having higher highs and lower lows. Bonds tend to be much more tempered, moving up and down to a much smaller degree than stocks. Diversification between asset classes reduces volatility. I like to moderate my portfolio with some diversification. By holding only a few stocks, I run the risk of systemic risks to my portfolio. For example, if I had invested all of my money into BP before the disaster in the Gulf of Mexico, I would have lost a tremendous amount of money. Oil companies were a good investment in 2010; BP as an individual stock was not. Unfortunately, these kinds of happenings are difficult to predict. Arguably, you could say that BP has come into trouble for lax safety standards before, and thus BP wasn’t a good investment. Looking back, it’s easy to say. Looking forward, this kind of clarity isn’t easy to see. 1. Cyclicality risk – Automakers and commodity producers are very cyclical in that their profits rise greater than economic growth in good years, and fall faster in bad years. Conversely, dollar stores tend to be counter-cyclical in that they see rising profits in recessions when people cut back to save money. 2. Commodity risk – Rising oil prices are great for oil producers, and terrible for airlines. Some companies are better at passing on higher commodity prices than others. As a rule of thumb, luxury and differentiated good makers like Coach can pass on higher leather and fabric prices than a company like Nike, which sells to a market that is more sensitive to price increases. Similarly, Starbucks finds it easier to pass on higher coffee prices than does Kraft’s Maxwell House brand. 3. Systemic risk – The only way to avoid systemic risk is to hold more than a few stocks in your portfolio. Seemingly random out of the blue events have taken down plenty of otherwise quality companies. 4. Regulatory risk – The extent to which you avoid heavily regulated industries depends on your own perspective. Investors have happily invested in for-profit education companies, despite the risk that their business is destroyed by an end to federal loan financing. It’s a difficult risk to truly measure – and unless you’re intimately familiar with regulatory history, one best avoided. When you think about diversification for your portfolio, think about how you can pair two businesses together. If you own a pizza restaurant company, then you might look for an agricultural stock that you like to balance the effect of rising food prices. Likewise, if you own a highly-cyclical stock like an airline or automaker, you might want to balance it with a consumer staples stock to temper total volatility. Also consider the type of stocks you own. Boring value stocks are going to get left behind in rising markets, whereas growth stocks rise fastest in “risk-on” environments. Similarly, dividend stocks are usually less volatile whereas stocks that have no dividend policy are more volatile. Penny stocks are another volatile type of stock with upside similar to growth stocks, as well as low capital requirements, however, they trade on OTC markets that require less transparency and financial accountability. Investors who invest in broad market indexes still have a lot to work with when it comes to diversification. Modern portfolio theory suggests that the safest returns relative to volatility come with a portfolio that is roughly 95% fixed income (bonds) and 5% equities (stocks). Conversely, the highest returns relative to volatility come with a portfolio that is 95% equities and 5% fixed income. 100% stocks – By far the most volatile, this allocation provided returns of 9.9% annually and had 25 years of negative performance. 80% stocks, 20% bonds – This portfolio was much less volatile than 100% stocks and had fewer negative years (23 of 86), but gave lower performance – 9.4% per year. 60% stocks, 40% bonds – Historically, investors with this allocation managed 8.6% annual returns with only 21 down years. 40% stocks, 60% bonds – With only 16 down years and an average annual return, investors managed a very good 7.8% return over the long haul. 20% stocks, 80% bonds – A very conservative portfolio, this portfolio had the fewest down years (12) and a very good average return of 6.7%. 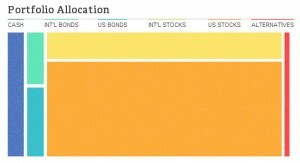 100% bonds – This portfolio had more down years than the 80/20 portfolio with 13 negative years out of 86, and returns were also muted to 5.6% annually. The focus here should be the relationship between total returns with differing asset allocations. In your early saving years, a stronger allocation to stocks will give you much better returns with volatility that young savers can tolerate. An 80/20 mix of stocks and bonds would be very good for most 20-somethings, and it has historically rewarded savers with 9.4% per year. Nearing retirement, the balance should shift toward fixed-income investments, as investors will undoubtedly have some drawdown from their portfolios as inflation and principal withdrawals affect portfolio performance. Pending that you have properly prepared, a retirement portfolio of 80% stocks and 20% bonds fits well for most retirees. If diversification overwhelms you, you might want to consider Betterment’s investing tools. At Betterment, you can select your risk tolerance, and they will invest your funds in a mixture of funds that will both match that risk tolerance and also give you an appropriate level of diversification. It’s amazing what technology can do these days! Here’s a picture of the Betterment tools that you can use to set your asset allocation. If you are like me and prefer to avoid as many fees as possible by doing it yourself, you may want to consider using Personal Capital‘s tool to evaluate your investment accounts. It’s completely free and has tools that will show your current allocation across multiple accounts. You don’t have to move your investments, and you can use their free tools to evaluate your allocation. Here’s a look at my portfolio’s allocation. Great run down. There are also a lot of other types of risks that you didn’t mention: interest rate risk, exchange rate risk, etc. Good points. I believe you have to have some risk early on to get the returns, but you should certainly stay within your comfort zone. You’ll just have to save more if you have a very low risk tolerance. Man, all this investment talk today, I need to look at my portfolio (though small) and make sure I’m not exposing myself to undue risk, or being too conservative thereby possibly costing me money. I like the 80/20 method as well, as I am a 26 and have a lot of time to invest. But as you said, that 80% better be diversified as well. Informative! You can also diversify with different types of investments – like real estate or precious metals.